Posted by admin in activity reports, Alaska, Batu Tara, Bezymianny, Chile, Cleveland, Dukono, Ecuador, Ekarma, eruptions, Etna, Guatemala, Hawaii, Indonesia, Italy, Japan, Kamchatka, Karymsky, Kilauea, Kliuchevskoi, Manam, Pacaya, Papua New Guinea, Planchón-Peteroa, Russia, Sakura-jima, Sangay, Seulawah Agam, Shiveluch, Sinabung, United States, Villarrica, Weekly Volcanic Activity Reports. Another week, another Weekly Volcanic Activity Report from the volcano-watchers of the Global Volcanism Program. The report is compiled by Sally Kuhn Sennert. 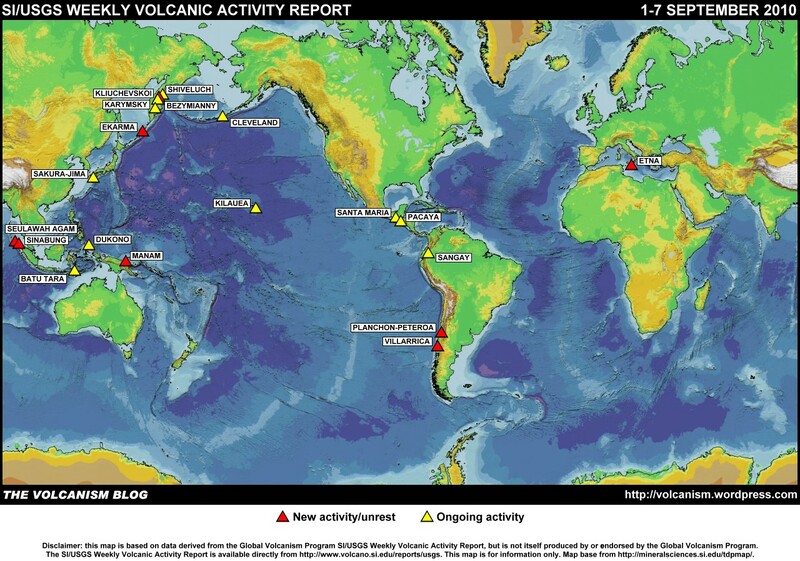 The Smithsonian Institution/United States Geological Survey Weekly Volcanic Activity Report for 1-7 September 2010 is now available on the Global Volcanism Program website. The following is a summary and not a substitute for the full report. 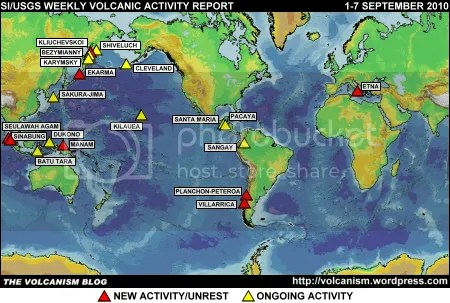 New activity/unrest: Ekarma (Russia), Etna (Italy), Kliuchevskoi (Russia), Manam (Papua New Guinea), Planchón-Peteroa (Chile), Seulawah Agam (Indonesia), Sinabung (Indonesia), Villarrica (Chile). Ongoing activity: Batu Tara (Indonesia), Bezymianny (Russia), Cleveland (Alaska, USA), Dukono (Indonesia), Karymsky (Russia), Kilauea (Hawaii USA), Pacaya (Guatemala), Sakura-jima (Japan), Sangay (Ecuador), Santa María (Guatemala), Shiveluch (Russia). Posted by admin in activity reports, eruptions, Indonesia, Seulawah Agam, Sinabung. News reports from Indonesia say that Mount Sinabung erupted again this morning for the third time since it re-awoke early on Sunday 29 August. Today’s eruption began at around 04:45 and seems to have lasted about five minutes and sent a plume up to 3 km altitude (10,000 feet). Reports describe the eruption as the strongest so far with a tremor that was felt up to 8 km away from the volcano and substantial ashfall. Darwin VAAC issued an ash advisory this morning reporting ash at FL100 (10,000 feet) based on data from the Indonesian volcanological authorities, but weather conditions have prevented any satellite confirmation of the altitude and extent of the emissions. Some local residents had begun to move back to their homes since the last eruption on Monday, but the Indonesian authorities say that all have been evacuated once again: ‘Last night the area within a six-km (four-mile) radius of the volcano was evacuated, all the police and people who had gone back to guard their homes and livestock got out’, government vulcanologist Surono is quoted as saying. ‘I predicted there would be a big eruption and I was right’. Via Eruptions comes more Indonesian volcano news: Seulawah Agam in north-western Sumatra has had its alert level raised from ‘normal’ to ‘yellow’ (alert level 2) because of increased seismic activity since April this year.